Synopsis: From the acclaimed author of the Morgan Kingsley, Exorcist books comes the gripping first novel in a new series about a private eye who discovers, to her surprise, that she’s an immortal huntress. Coming into this book, I knew literally nothing except for the fact that it dealt with Greek mythology (which now that I have read it, I know that isn't entirely true). A friend from the summer medical program I was in recommended this book to me, and despite every fiber in me telling me that I probably might not like it, I decided to read it anyway. I have mixed feelings about this book. I really enjoy the concept, but I'm not entirely sure it was executed well. The entire premise that there are certain people descended from various gods across all mythologies is really cool to me. However, the fact that when people learn this and don't question it is not cool. Literally all of the characters who didn't know about this system before the plot started but came into this world didn't even question anything. I know if I were in that situation, I would be questioning literally everything about the system and even life itself. As for the characters, for the most part I liked them. They were all different from one another and brought their own traits. 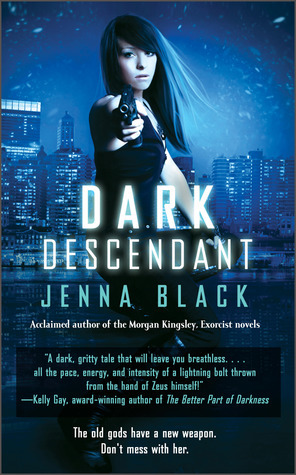 The main character, Nikki, was pretty typical of books like this, which isn't necessarily a bad thing, but she was nothing unique. With regards to the writing, it was really nothing special, which at this point in my book blogging career, I really don't expect great writing anymore, especially from an adult book. As for the plot, I honestly felt like this could have been a standalone. Like literally everything wrapped up nicely at the end, and I'm not entirely sure what the rest of the series is about. I haven't decided whether or not I'm going to continue the series. But back to the plot. I thought it was very cookie cutter and a bit too fast paced. Everything happened perfectly and predictably.